CCTV vs. Security Systems: What's the Difference? CCTV (Closed Circuit Camera System) vs. Security Systems: What’s the Difference? If you’re like me, then when you hear the term security system, you immediately picture enough security cameras to make any James Bond villain proud. But when you dig below the surface of security you’ll find that protecting your home encompasses a whole lot more than simply adding security cameras. So what exactly is a security system if it’s not just the cameras? To answer that, you need to understand how different pieces of security equipment keep you safe, and when looking at CCTV vs. Security Systems, this means knowing the difference between surveillance and security. Surveillance is the act of carefully watching someone or something in order to prevent or detect a crime. Crime prevention is always a good thing, especially when it comes to your home and personal safety. Security cameras can be a tremendous addition to the overall security of your home. Closed-circuit Television, or CCTV, systems are based on a strategically placed network of video cameras, which capture footage and either broadcast it in real-time to a surveillance monitor, or record it (digitally or analog) for later reference. While the purpose of surveillance is to help detect crime, security goes a step farther by keeping you safe from harm. Crime is certainly harmful to the victim; however, there are countless circumstances in which you, your home, or your family can be put in harm’s way that aren’t necessarily related to crime. Let’s take a look at a few security features other than CCTV that can help protect your home. Security Sensors for more than just video, i.e. flood, motion, glass break, etc. Carbon Monoxide: You cannot see, smell, or taste this toxic gas. If your home reaches dangerous levels of carbon monoxide, a sensor will warn you so you can get your family to safety. Flood: Generally installed in the basement, a flood sensor will detect unwanted water before it can wreak havoc, seriously damaging or flooding your home. Freeze: Freeze sensors detect dangerously low temperature levels that can freeze your pipes, which can result in expensive repairs. Glass Break: Glass break sensors detect the frequency at which glass breaks notifying you if someone or something breaks your window. Heat/Smoke: Heat/Smoke detectors monitor rapid increases in temperature and detect smoke, which are both signals of a fire in your home. Motion: Motion detectors sense movement and alert you of potential break-ins. These sensors are strategically placed throughout both the interior and exterior of the home. Window/Door: Window/Door sensors notify you when a window or door has been opened, keeping criminals out and children in. 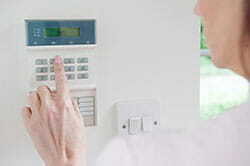 A monitored security system is one of the most commonly used alarm systems. When an alarm is triggered, the system alerts a monitoring center agent and the agent then notifies the police. Monitoring fees are generally attached to this type of system. Check out our top picks for monitored security systems. 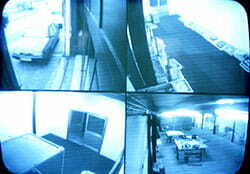 A self-monitored security system is exactly what it sounds like, self-monitored. Instead of notifying a monitoring center agent when an alarm is triggered, you receive 24/7 notifications directly to your phone. It is up to you to decide when to call the police. Since this is a self-monitored system, there are no monitoring fees attached. You are the contact between your system and the police, which can be potentially problematic if you are busy and a notification goes unnoticed. Take a look at our suggestions for best home security without monitoring. A local security system will set off loud alarms/sirens when triggered, alerting those within earshot. A local security system does not notify a monitoring center agent or the police and instead relies on the owners or neighbors to alert the authorities. Local security is another type of non-monitored system which means there are no monitoring fees. CCTV is an excellent surveillance option to help detect, capture, and prevent criminal activity on your property, though it should be considered as an additional part of your overall security system, and not a system on its own. It’s important to remember that security exists to keep you safe from harm, whether that be from home invasion, fire, flood, or any other type of disaster. Whatever your style, a security system should monitor anything that could potentially harm your home or your family and provide peace of mind that you are safe and protected. Our best security systems list or our most affordable home security systems list will have everything you’ll need to know in order to make the right choice for you. It’s important to find a security system with the right features that will make you feel safe and secure.